Such a lovely post. The first video almost bought tears to my eyes! I’m a great believer of what goes around comes around. Teaching my child to learn that even a smile is charity and can make someone’s day and to treat others how you want to be treated. 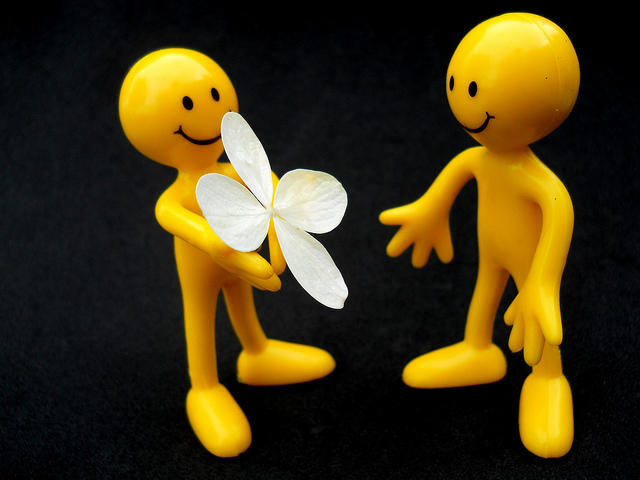 It’s great when science shows us what is naturally innate within us – to be kind to others. Reading this has made me feel happier. Thanks for sharing. Thanks for your visit and for your lovely comment, Teresa. I’m glad it moved you. Please do come again! This is so true. Kindness has benefits all around. I have noticed, however, that people almost seem to be afraid of being kind. They may be afraid of being taken advantage of or having someone spurn their kindness. I believe that this is because our society doesn’t value kindness enough. What do you think? Have you noticed people who seem almost afraid of being kind? Thanks for your visit and your comments. Probably part of the problem is that in our culture kindness may be seen as a sign of “weakness” and vulnerability…or maybe that’s just our fear talking. Hmmm…. Interesting piece. I’m always of the opinion of not judging people by their actions because there’s a whole lot going on in that person’s life at that moment that you have no idea about, so it’s best to always treat them nice, who knows, your kind gesture might just be what they need to get out of that situation. Dhayours, thank you for your visit and for sharing your comments. I do appreciate it. I asked her why. She said that she feels good when she gives someone something and if I intervene then I steal the happiness away from her. lol What a great line! I do agree with you, Nuttanee, and I like your friend’s thought as well! Thanks for your visit and for sharing your story. I do appreciate it. This inspirational story of Teddy and his teacher is one of my all-time favorites. And it still makes me cry everytime I read or watch it told. I’d say it is a story worth retelling as the message to and impact on hearers remain the same. Nobody should have to tell us how a small act of kindness like a smile, a simple “thank you” or “how are you doing today?” can make a big difference in the lives of others. I believe we have been designed to care for one another, unless something else happened that made us behave just the exact opposite. I find it interesting that you mentioned how the love hormone oxytocin is released as a result of an act of kindness. If we could all just learn to be more caring and kind not only to those who are nice to, what an ordinary difference that would make. Thanks for your visit and for sharing your thoughts, Alice. I am really glad you enjoyed the post. I agree with you that we should not need to be reminded that simple kindnesses do make such a big difference in our lives, but the press of everyday does make us forget, I think.